Do’h. I guess I was a bit too late in playing the range. In hindsight, I should’ve realized that I was going for a fourth bounce… And remember, the more times support is tested, the more likely it would break. If I wanted to go long on the pair, I should’ve done it much sooner, probably on the second or third bounce. Apparently, concerns regarding Greece’s debt situation broke out again last week. Experts and analysts are saying that the joint EU-IMF bailout will would not be sufficient, sucking the life out of the euro. It fell against the dollar, the yen and even the pound. Needless to say, I got stopped out. Stopped out at 0.8750: Total Loss -57 pips / -1.00%. 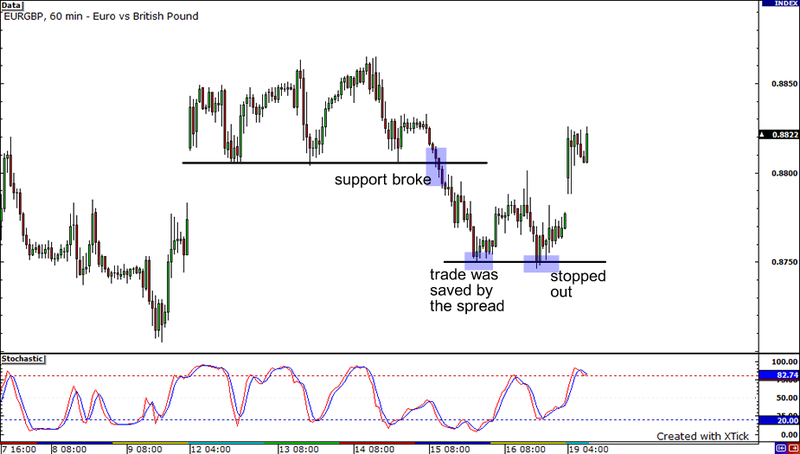 I haven’t been trading the EURGBP pair recently but I just saw a simple technical setup on the 1-hour chart. The pair just broke above the falling trendline when it made a huge leap over the weekend. Right now, it seems to be consolidating within a box formation between the 0.8810 and the 0.8865 levels. Since the pair is now sitting at the bottom of the range, I decided to enter at market. I placed my first profit target near the top of the range and my second profit target at the psychological 0.8900 handle. 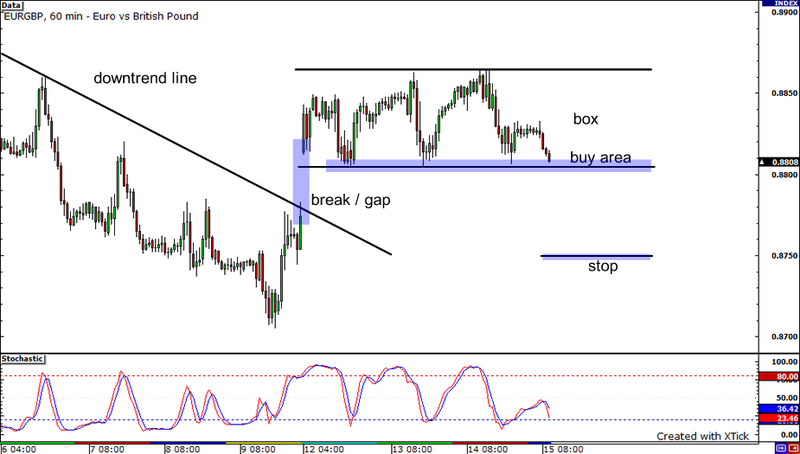 Because the pair moves an average of 70 pips in a day, I’ve set my stop around the same distance from my entry. Fundamentally speaking, it seems like much of the bad and good news surrounding the euro zone and UK have already been priced in by traders. This has caused the pair to end up directionless and bounce around a tight range the past few days. With only a bunch of low-profile economic data like euro zone’s consumer price index and trade balance coming up, I suspect this range bound movement would continue throughout the week. Long EURGBP at 0.8807 (market), pt1 at 0.8860, pt2 at 0.8900, stop at 0.8750. I’m hoping this simple trade works in my favor so that I could grab on to some pips now that the NBA playoffs are about to kick off. It’d be hard to keep my one good eye focused on the games and the charts at the same time! I’m really looking forward to that Lakers – Thunder match-up! KD35 baby! By the way, my EURJPY trade is still open! It’s having a tough time hitting my first take profit point! Check it out at MeetPips.com!